Hey there! Are you all enjoying the holidays? And did you get the gifts you were hoping to? I'm happy to say I got my greatest wish despite some bumps along the way, and Christmas was then wonderful =D. Not only did I receive some awesome kitchenware, cookbooks, and jewelry from P's family; but also thrilling news that my best friend N finally made it home and would be coming to visit on Wednesday. With another tarte tatin and lots of girl talk to look forward to, I couldn't ask for a better transition into the New Year. 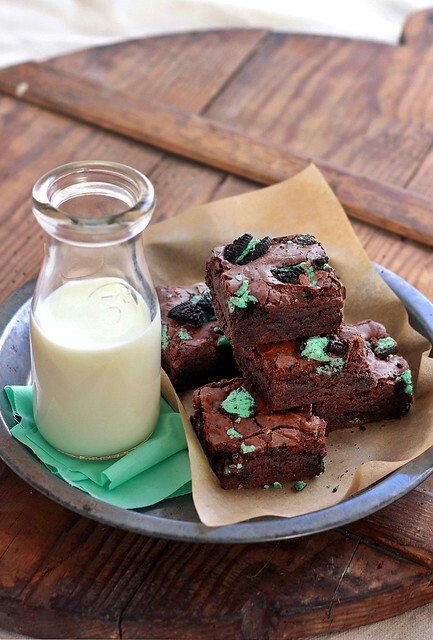 Speaking of New Year's, may I recommend these Peppermint Cookies N' Cream Brownies for your next holiday party? Chopped up cookies are mixed into a fudgy brownie base to add richness and crunch. Meanwhile, the mint flavor is a fun nod to the weather outside. These babies are a bit extravagant, I have to say (especially compared to my go-to chewy cocoa brownies). Yet what better time to indulge a little than while you're joyfully gathered with those you love? Hope you enjoy these, and I'll see you all next year! XIAOLU'S NOTES: While I love the peppermint flavor, these would still be delicious with regular Oreos. 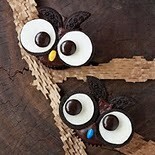 You could also play around with other chopped up cookies or even candy bars. For those who'd prefer a smaller batch, simply halve the recipe and bake in an 8-inch square pan. Also, I actually overbaked this batch by a few minutes, so if you follow the recipe your brownies should be even fudgier than my photo shows. If you prefer a sturdier slice, simply bake 5 minutes longer. Preheat oven to 350 degrees F. Line a 9 × 13-inch baking pan with parchment paper, and grease areas not covered by paper (if any) lightly. In a medium-large saucepan over low heat, melt together butter and chocolate, stirring occasionally. Whisk in sugar and salt until thoroughly combined. Continue heating and stirring until the entire mixture is hot and smooths out somewhat but is not bubbling. Remove from heat, and let cool slightly (about 5 minutes) to avoid cooking the eggs when added. Stir in vanilla, then add eggs one at a time, whisking immediately after each addition and mixing until each egg is fully incorporated before adding the next egg. Whisk in flour and cocoa powder thoroughly until mixture is uniform. Switch to a spatula or large spoon and fold in 2 cups of chopped cookies. Pour batter into prepared pan and spread out evenly with spatula. Sprinkle remaining 1/2 cup of cookie pieces on top of batter. Bake for about 35 to 40 minutes, until a toothpick inserted into the center comes out with moist crumbs, but not coated with batter. Cool brownies in pan for about 20 minutes, then lift brownies in the paper out of the pan and place on a wire rack to cool completely before slicing. Posted by Xiaolu at 7:30 PM 56 comments so far. Add your own? 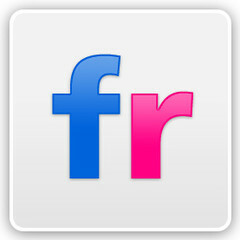 UPDATE: I've made some updates to the blog header and colors. I know a lot of you liked the bold red, but I was ready for a change. I'd love to know what you think of the new design! I'll tell you straight up...I'd expected and hoped to be writing a different post today. A post dedicated as much to recounting a fun-filled reunion with my best friend N as to the delicious tarte tatin we'd have baked together. But Mother Nature clearly had other plans. Snowy slick wintry weather plans that crippled London's Heathrow Airport to a surprising extent and are thus keeping N and me just as far apart as we've been for the last 2 years. While I agree safety should be their top concern, I can't help but feel an intense frustration for not only N and myself but also the thousands of other families and loved ones who're losing the precious time they'd planned to spend together. It boggles the mind a bit that such a major airport would be so ill-prepared for a little snow (at least compared to my area's "Snowpocalypse" last winter 8p). But before you think I've gone Debbie Downer for good, let me assure you that the force the holiday spirit remains strong in this one ^_^. I trust the airport staff and British government are working their hardest to remedy the situation. On top of that, life is simply unpredictable and the essence of the holidays to me is to appreciate what we do have. For me that includes a delicious dinner with Mom tonight, Christmas with my boyfriend and his fun and generous family, then a long weekend visiting Dad and my adorable baby sisters. Though I'm still desperately hoping to meet up with N for even a few hours, I clearly have a lot to be thankful for and look forward to. So with a warm and cheerful heart, I still made this lovely tarte tatin on the day N had planned to join me. As I took my first taste, I knew she'd have loved its warm spices and little bursts of tartness. I'll definitely be saving this recipe for whenever we do meet up, whether in a week or a year. Do you also have someone you love but won't be able to see this winter? If so, is there something special you cook or bake to remind you of them? 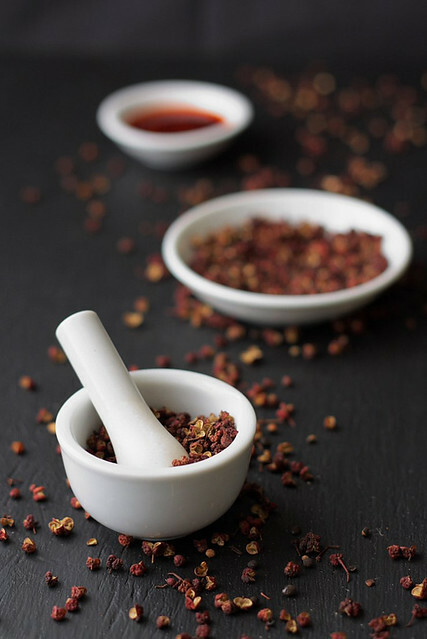 XIAOLU'S NOTES: The original recipe called for 1 tsp of British "mixed spice." I don't have access to this, so I used some of its component spices instead. Feel free to use mixed spice if you have it. 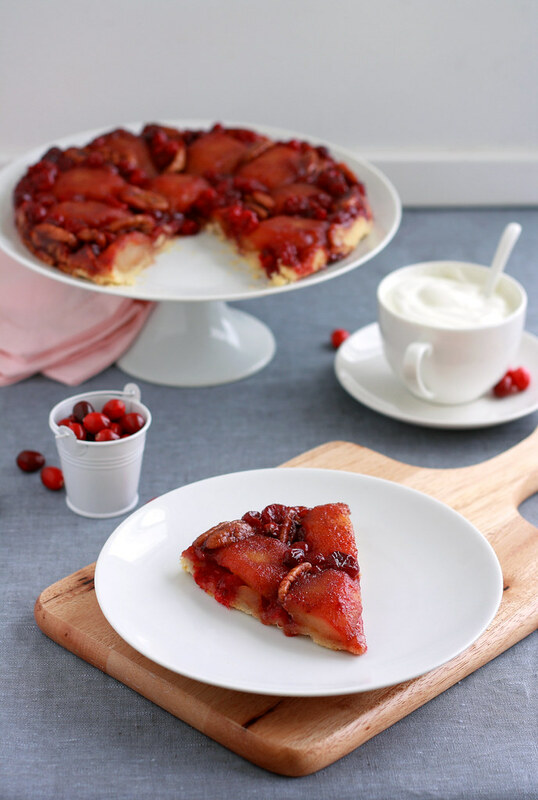 If you have a 9-inch ovenproof pan, you can use it to cook the fruit then spread the pastry directly on top. 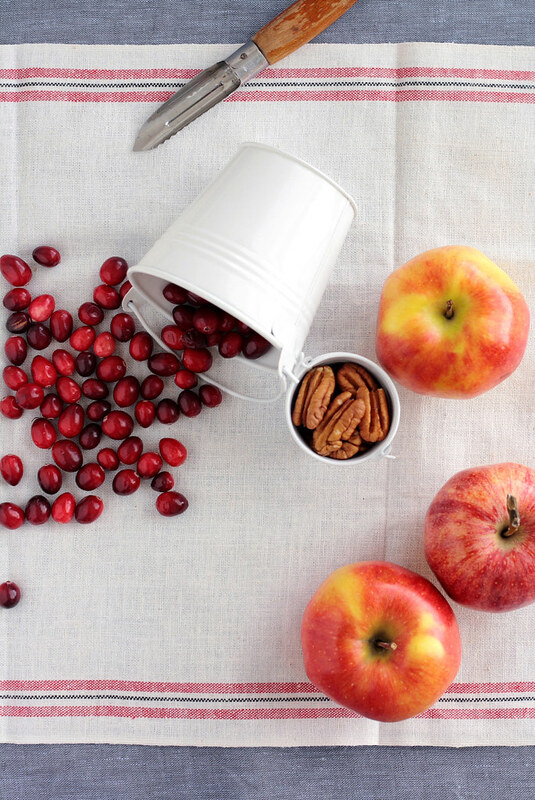 Dried cranberries will also work if you don't have fresh. Melt the butter in a large frying pan until foaming. Add the sugar and apples, and cook gently over a medium heat for about 10 minutes, or until the apples begin to soften and the sugar is dark and syrupy. Stir in the cranberries, pecans and spices and continue cooking for another 5 minutes (some cranberries will break open). 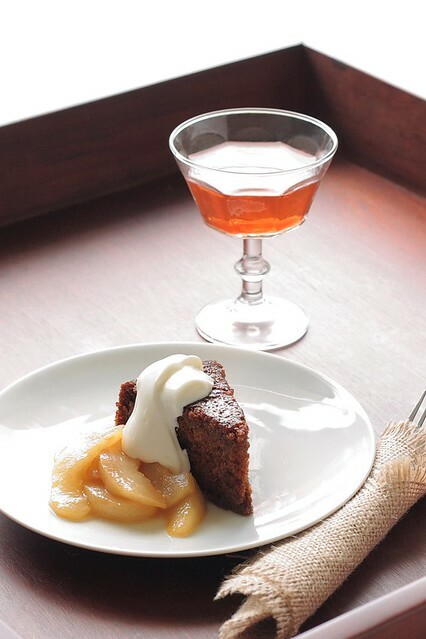 Transfer the buttery apple mixture to a 9-inch round shallow cake pan (not springform) or tarte tatin pan. Allow to cool. Preheat the oven to 400 degrees F. Roll the pastry dough into a disk, roughly 10 inches in diameter, to fit the top of the pan. Lay the pastry over the top of the apples, trim away any excess and tuck the pastry in around the sides. Chill for 5 minutes. Place the tart on a baking sheet and bake in the center of the oven for 25 to 35 minutes, or until the pastry is golden brown. Remove the pan from the oven and let cool in pan on wire rack for 5 minutes. To turn out the tart, place a serving plate over the top of the still-hot pan and invert, taking care to protect your hands from the extremely hot liquid caramel. Cut into wedges and serve with scoops of vanilla ice cream or lightly sweetened cream, sour cream, or Greek yogurt. Posted by Xiaolu at 11:00 AM 39 comments so far. Add your own? I'm proud to make good on my promise to share something yummy by week's end...despite falling prey to a nasty cold the day before my last exams and remaining in its clutches all week. We also just got our first real snow of the year (yay! ), and I'm wishing for a white Christmas. Hope you all are as excited for the holidays as we are and keeping yourselves nice n' warm =D. A bit of a surprise even for me, but today's recipe is inspired by Starbucks! While they've somehow managed to ruin every type of baked sweet I've sampled (even the classic CC cookie), their stuffed pretzels were actually quite good. I use the past tense because I'm not sure they still make these as I can't find any mention on their website. But whether or not they still sold them, I knew I could make my own at home, where they'd be fresher and much cheaper. 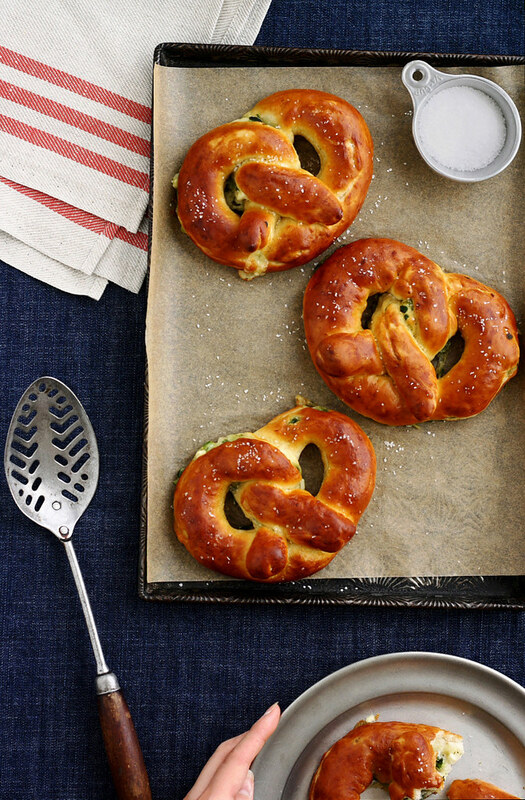 A quick Google search revealed no shortage of soft pretzel fans out there, and I quickly found a recipe for a slightly sweet pretzel with pillowy soft insides. The dough couldn't be easier to mix up but with the rising and assembly time required, I decided to keep the filling fast and easy. Ready-made creamed spinach with a spicy kick, gooey mozzarella, and flavorful crumbled feta. Before we knew it, P and I had an irresistible snack on our hands. And you might say, half the batch and 2 hours later, that we made no attempt to resist 8p. I'm sending this over to Susan at Wild Yeast for her weekly Yeastspotting event, where I've noticed the round-ups growing larger recently. 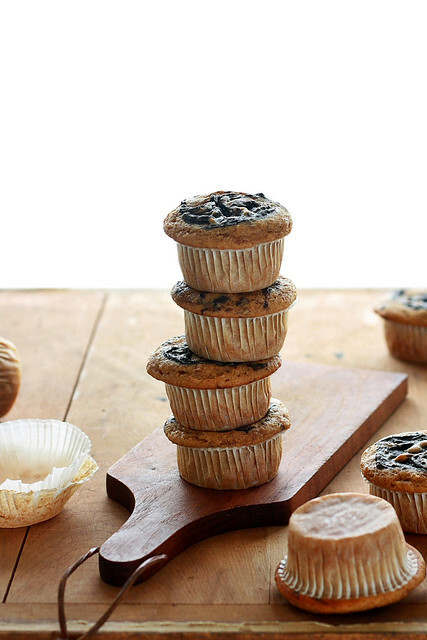 Have you guys been baking any yummy yeasted treats? Please do tell me all about them! XIAOLU'S NOTES: The amounts of filling ingredients given below are approximate. You may use a little more or less depending on personal judgment, how wide you press the dough, etc. Also, I already reduced the sugar greatly from the original dough recipe, but feel free to change the amount to as high as 1/2 cup. If you don't have a stand mixer, just mix the dough ingredients in the same order as below but with a wooden spoon, then knead by hand for 5 to 8 minutes until dough is smooth. In a small bowl combine warm water, 1 teaspoon sugar, and yeast. Let stand for 10 minutes or until foamy. Put 3 1/2 cups flour, 1 tablespoon sugar, 1 teaspoon kosher salt, and 1/2 teaspoon table salt in the bowl of your stand mixer. Mix with the paddle attachment for a few seconds. Add vegetable oil and yeast mixture and just mix until moistened. Switch to the dough hook and knead on medium speed until the dough is smooth and clears the sides of the bowl, about 5 minutes. Add in the remaining cup of flour while dough is kneading. When dough is done kneading, place in a large oiled bowl. Cover with plastic wrap and let it rise till doubled in size, about 1 hour. 30 minutes before you plan to bake, preheat the oven to 450 degrees F . Spray a baking sheet with non-stick spray or line with parchment paper. Dissolve baking soda in hot water. When dough has risen, turn it out onto a floured surface and divide into 12 equal pieces. Roll each piece into a rope, roughly 1/2-inch diameter. Press the ropes flat, until about 2-inch across. Mix red pepper flakes, if using and to taste, into the creamed spinach. Spoon a 1/2-inch wide row of spinach mixture down the center. Sprinkle a small amount of mozzarella and feta cheese over the spinach. Roll up dough about the filling and pinch the edges shut. Shape into pretzels, gently pressing ends down to attach. Carefully dip pretzels, one at a time, into the baking soda/water, then place pretzels on baking sheet. Be gentle to avoid the filling breaking through. In fact, these are delicate enough that you might want to lower the pretzels into the water while in your hands instead of dipping. Bake for 8 minutes, or until golden brown. As soon as the pretzels come out of the oven, brush with melted butter and sprinkle with a little salt. Let cool 5 minutes. Then enjoy right away or reheat leftovers later in a toaster oven, sandwich press, or even waffle iron. Posted by Xiaolu at 6:00 PM 56 comments so far. Add your own? All this studying is making me loopy, y'all. So I took a sanity break, and here's the result...though you might disagree with the "sanity" bit after I explain this photo ;p (and please pardon the graininess). Since a vintage baking pan I bought was bent, my boyfriend P suggested we try to straighten it with weights on top. 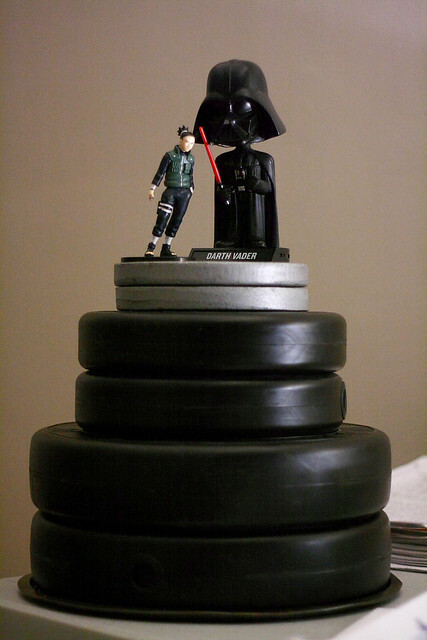 When I joked the tower looked like a wedding cake, he brought over his Darth Vader bobblehead and anime figure as the "happy couple." The result was so silly, I just had to share it. We can all benefit from a lil' laughter during stressful times, right? Posted by Xiaolu at 5:31 PM 33 comments so far. Add your own? Posted by Xiaolu at 11:00 AM 19 comments so far. Add your own? One of the greatest joys of entering the blogging world has been meeting so many talented, large-hearted bakers and cooks who share my passion for good food. One of these amazing individuals is Hannah Kaminsky, vegan baker extraordinaire and mastermind behind the lovely Bittersweet blog. Her credentials are beyond impressive: she'd won baking awards and written a cookbook by college! When her publisher offered me a free review copy of her book, My Sweet Vegan, I naturally jumped at the opportunity. I was immediately impressed by the variety of offerings in this book. The recipes are divided into 5 sections: Sweet Starts (like Golden Glazed Donuts), Cookies and Bars (like "Cheese" Cake Thumbprint Cookies and Peanut Butter Bombs), Cakes and Cupcakes (like Bananas Foster Cake and Mocha Devastation Cake), Pies and Tarts (like Baklava Tart and Pink Lemonade Tartlets), and Miscellaneous Morsels and Desserts (like Green Tea Tiramisu and Hazelnut Ravioli). Plus each and every recipe comes with a color photograph and inviting introduction from Hannah. Ultimately I tested the Self-Frosting Peanut Butter Cupcakes, Orange Hazelnut Biscotti, and Green Tea Freezer Pops. All delicious, and even my non-foodie boyfriend raved about the cupcakes and biscotti. The self-frosting cupcakes, made by swirling the chocolate "frosting" into the batter before baking, were a tasty and much faster alternative to my usual. With a cake so moist and flavorful from the peanut butter, butter and eggs weren't missed at all. The popsicles were fast, easy, and refreshing. Featuring almond and green tea flavors paired to great effect. Finally, you can find my detailed review of the biscotti (with recipe) in this past post. It's true that recipes are the heart and soul of any cookbook. Yet sometimes it's the little thoughtful touches that win me over. In My Sweet Vegan, these were the Ingredient Guide and Food Allergy Index. While many ingredients in this book are probably already in your kitchen, a few are made especially for vegan cooking (like vegan cream cheese and soy yogurt). Luckily Hannah provides a lot of guidance for finding these. Unlike many cookbooks that just say an item is "available at specialty stores" (as if that's helpful?! ), Hannah tells you not only the type of store but often the section where you're likely to find it. She also provides an index of the recipes that are gluten-free, soy-free, nut-free, etc. at the end of the book for those struggling with allergies. Are you starting to get the impression that I like Hannah and her book 8p? I had so much fun reading and baking from it, I hope you'll give it a chance, too. If you've got holiday shopping left to do, My Sweet Vegan would make a lovely and affordable gift for any adventurous bakers or vegans in your life (yourself included ^_^). Posted by Xiaolu at 1:45 PM 36 comments so far. Add your own? Posted by Xiaolu at 12:15 PM 49 comments so far. Add your own? Posted by Xiaolu at 1:53 PM 19 comments so far. Add your own? Happy Thanksgiving, you all! I'm lucky enough to be spending this special day surrounded by a lot of love and family (both mine and P's). Despite no small number of trials and tribulations this past year, I feel so grateful to have the support of amazingly generous friends and kin. And I'm learning to have faith that things are going to get better given time. Speaking of gratitude and faith, Thank You for joining me on this mostly culinary, sometimes musical, journey I started nearly a year and a half ago. Whether you've been with me since the beginning or have just joined the fun, I'm so glad to have you =). I can't send a real treat to each of you. But I wanted to at least share this image of the salted caramel chocolate cake I made with love, for those I love, to indulge in today. 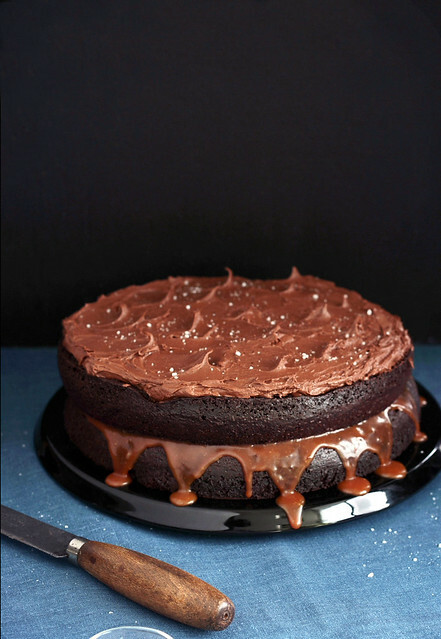 Surely you're already familiar with the wonders of caramel, chocolate cake, and buttercream? So I'll keep it sweet and simple with: It's a fantastic cake. Please do give it a try. One last thing...I really hope each and every one of you gets to share lots of food and laughter with your loved ones today! XIAOLU'S NOTES: I recommend making the filling before the cake layers so the first has time to cool; it can be made up to 3 days ahead. I actually reheated my filling just a tad too much, making it runny. Keep a careful eye on it, and it should remain firm enough to stay put. 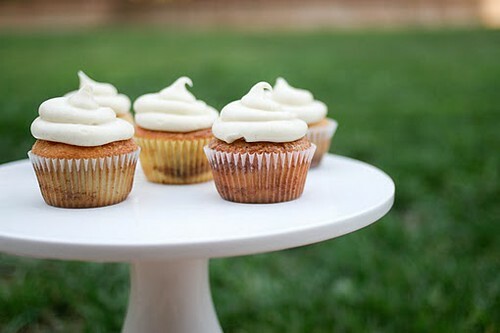 The frosting can also be mixed up ahead of time, chilled, and brought to room temperature before using. Preheat the oven to 350 degrees F. Grease and dust with cocoa powder two 9-inch round pans. Optional but helpful: line pans with parchment circles. In large bowl, sift and then stir together the flour, sugar, cocoa, baking soda, baking powder, and salt. Add the eggs, buttermilk (or milk vinegar mixture), coffee (or reconstituted coffee mixture), oil, and vanilla extract. Beat by hand or with an electric mixer on medium speed until well combined. Pour the batter, which will be thin, into the prepared pans. Tap the pans firmly against the counter one time to remove any air bubbles. Bake just until a toothpick inserted into the middle of the cakes comes out clean (about 35-40 minutes). Let cakes cool in the pans for 10 minutes, then remove to wire racks and let them cool completely there. Place a small dollop of frosting in the center of a cake plate or stand and top with one cool cake layer. Warm the caramel filling still in the saucepan over low heat for 5 seconds at a time, stirring in between, until of thick spreadable consistency. Spread evenly over the cake. 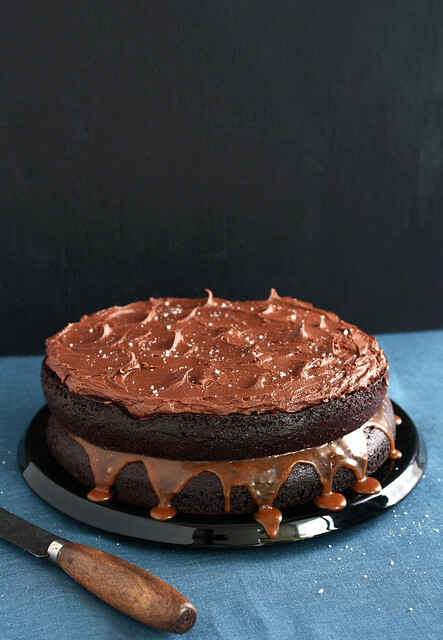 Place the second cake layer over the filling and frost the top with chocolate buttercream. Finish the cake off with a sprinkle of sea salt, if desired. Serve immediately or refrigerate until needed. Cake will keep for 4 or more days if well covered. Place the sugar, water, and corn syrup in a large heavy-bottomed saucepan over low heat. Stir until the sugar is dissolved. Turn the heat up to medium and allow the mixture to cook without stirring until the sugar turns a dark amber color (about 10 minutes). Remove the pan from heat and pour in the cream (the mixture will bubble up). Stir well, then stir in the butter and salt. Let the filling cool to room temperature. Then cover the pot and chill in the refrigerator until needed. Sift the cocoa powder, powdered sugar, and salt into a small bowl. Cream the butter with an electric mixer in another bowl. Alternate adding the sifted mixture with adding the cream, mixing well between each addition. Continue beating until the desired texture is achieved. Add more cream or powdered sugar if you want to thin or thicken the frosting. Posted by Xiaolu at 3:00 AM 61 comments so far. Add your own? Do you remember the first time you tasted kale? I do. It was just 3 years ago. I'd felt "adventurous" at the farmers market, but had no idea what to do with my new bag of strangely sturdy greens once I got home. Flipping through a favorite Italian cookbook, a rustic dish with soft onions and creamy white beans caught my eye...then wooed my taste buds. I've adored kale ever since. That first dish has been made over and over again (and I promise to share the recipe later). But this nutritional powerhouse deserved to be more than a one-trick pony. 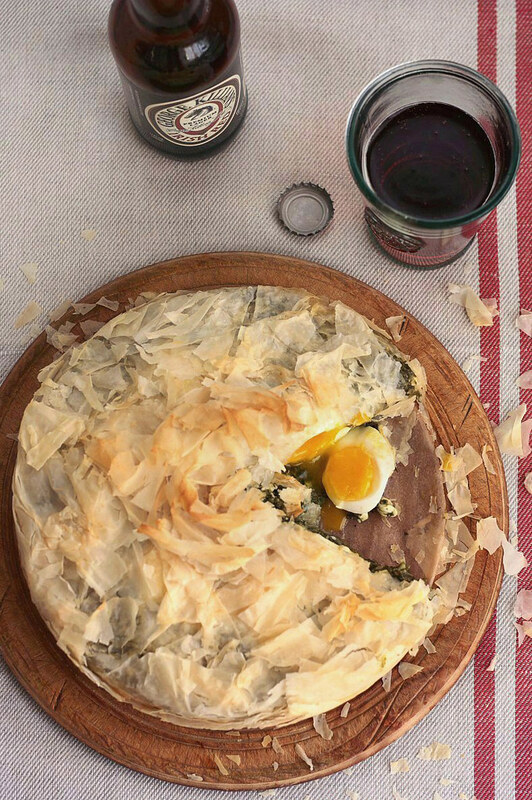 For my latest kale-scapade, I settled on an intriguing ricotta, winter greens, and egg phyllo pie. Turned out a bit messy, as you can see 8), but full of lovely, well-balanced flavors. The bitterness of the kale mellowed by the slight sweetness of sauteed leeks and creamy cheeses and eggs. The only change I might make next time is to use puff pastry instead of phyllo to get this on the table faster. So tell me, dear readers, do you enjoy winter greens? If so, what should I add to my currently limited repertoire? P.S. - I've gotten behind on stopping by your blogs in the last week due to exams. Sorry 'bout that and I promise to catch up soon! XIAOLU'S NOTES: I think the extra flakes on top of my pie come from using old and thus drier phyllo pastry, so use a fresh batch for a neat presentation. I adjusted the recipe below to fully cook the eggs. Feel free to substitute swiss chard for half or all of the kale. But you'll need slightly less swiss chard, since it has smaller stems than kale. Cook eggs in a pot of boiling water for 7 minutes. Then drain, cool in ice water, then peel and set aside. Coarsely chop leaves of greens, steam for 6 to 8 minutes or until wilted, transfer to a colander to cool, then squeeze to remove excess water (It's important to squeeze hard!). Heat oil in a saucepan over medium-high heat, add leek and garlic and cook for 5-6 minutes or until very soft. Transfer to a food processor, add greens, and process until finely chopped. Transfer to a large bowl, then add cheeses, scallions, olives, and oregano. Mix well and season to taste with sea salt and freshly ground black pepper. Preheat oven to 350 degrees F. Place an 8-inch springform or other cake pan on a cookie sheet, brush the inside of the pan with butter, line with a piece of phyllo, allowing excess to overhang, brush with butter and top with phyllo. Repeat with remaining phyllo and butter, finishing with phyllo. Spoon 2/3 of ricotta mixture into the phyllo-lined pan, smooth surface, then create 6 wells for the eggs around edges, using a spoon. Place eggs in wells, then spoon over remaining ricotta mixture, smoothing top. Fold overhanging pastry inward, brushing with butter between each layer and pleating as you go. Brush top with butter and bake for 40 minutes or until golden. Posted by Xiaolu at 1:00 PM 44 comments so far. Add your own? My boyfriend P has a busy, active job and is often too busy to eat a big lunch, if any lunch at all. It's no surprise then that he comes home hungry at only 5 p.m. For those days especially, I have a list of go-to meals that can be whipped up in no time. And while P's sweet enough to try almost anything I cook, I reserve this list for only the dishes he gets excited about. 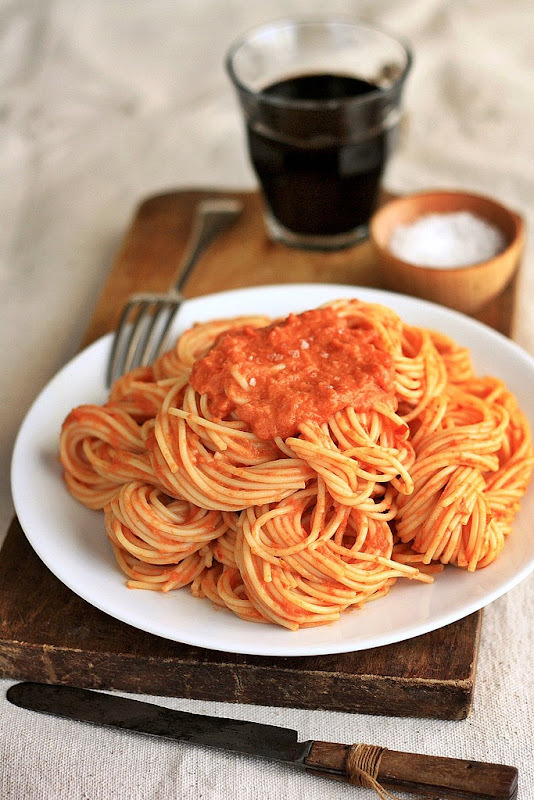 Chief among them is this fabulous spaghetti alla vodka. P's not much of a foodie. So it's easy to tell when he loves a dish. The giveaway is usually his request to "never stop making this!" Exactly what he said after his first taste of this creamy tomato pasta made moreish by the addition of a little alcohol. Don't worry if you don't like the taste of vodka (I don't either). Cooking mellows the flavor so you won't even know it's spiked ^_^. I'd actually seen many versions of this dish long before, yet was always scared off by their copious use of heavy cream. I know, I know...nothing provides the same luxurious mouthfeel or coats pasta as well. But why drown out all those vibrant flavors from the tomato sauce? This version from Cooking Light magazine uses the amount needed to provide those textural benefits and no more. Still an indulgence, but a much healthier one. Do you also have a go-to list of quick, delicious meals for those really hectic days? I can't wait to hear what's on it. 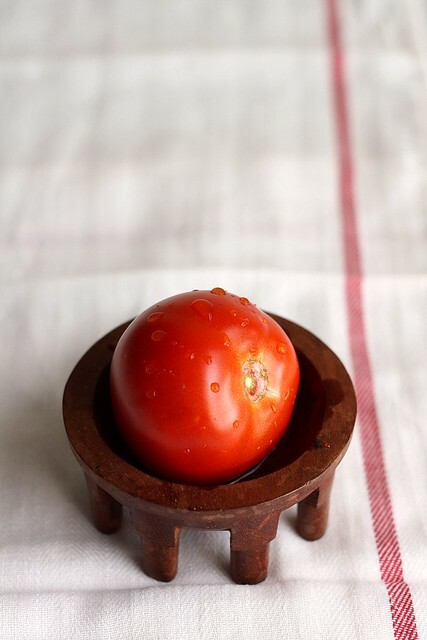 XIAOLU'S NOTES: I HIGHLY recommend using fire-roasted canned tomatoes for this recipe -- it adds that much more depth to the flavor! I hesitated to add this detail before when Muir Glen made the only widely available version since they're a bit pricey. Luckily, Hunt's has come out with a version that's even easier to find than Muir Glen's and about as cheap as non-roasted diced tomatoes. Enjoy! Heat oil in a large nonstick skillet over medium-high heat. Add onion to pan; sauté 4 minutes or until tender. Add pepper, garlic, and bouillon; sauté 1 minute. Add vodka (when cooking with alcohol, there is always the chance of it catching on fire, so be very careful); bring to a boil. Reduce heat, and simmer 3 minutes or until liquid is reduced by about half. Stir in 1/3 teaspoon salt and tomatoes; bring to a boil. Reduce heat, and simmer 15 to 20 minutes. Remove skillet from heat and let cool slightly. 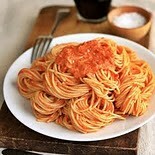 IF you have stick blender, you can now puree the sauce right in the pan (easy peasy!). OTHERWISE, place tomato mixture in a conventional blender. Remove center piece of blender lid (to allow steam to escape); and secure the lid on blender. Place a clean towel over opening in blender lid (to avoid splatters), and process until smooth. Return tomato mixture to pan. Mix in cream, then cook the sauce for 2 minutes over medium heat, stirring constantly. Remove from heat. Stir in cooked pasta and basil. Taste the pasta and add more salt if needed. Serve immediately. Posted by Xiaolu at 11:30 AM 127 comments so far. Add your own? I adore cheesecakes but don't bake them too often because of (a) the fat content and (b) fear of The Terrible Cracking (sounds like a Halloween tale, doesn't it?). Let's be really honest with each other...it's mostly (b) that's kept me away. But when my friend Yida (check out his kickass Halloween costume) requested blueberry cheesecake cupcakes for his birthday, it was time to get past (or around) the fear and I thought I'd found a great way to do just that. Several sources told me mini cheesecakes were less prone to cracking, even without a water bath. You can bet I was excited 'bout that! Still, there was some contradicting advice floating about. The Martha Stewart recipe I adapted called for bathing the cupcakes ^_^, but Annie's Eats got gorgeous results skipping that step. Always wanting to see for myself, I baked some with a water bath and some without. When the cakes in the water bath turned out slightly undercooked but the others rose high and sunk oh-so-low, I went in search of middle ground. Google led me to this page very helpfully explaining The Cracking/Sinking Phenomenon. The main culprits: over-beating, over-baking, and contraction as the cake cools. Shortening the mixing time and lowering the oven temperature without a water bath produced the results I was hoping for. Firm, delicious cakes without a tendency to cave in. Sure, there's still an occasional crack along the marbling, but people will be too busy wolfing them down to notice =). Do you guys enjoy cheesecake as much as I do? I'd love to hear about your favorite variations. Plus any tips would be great, as I'm still very new to making them! XIAOLU'S NOTES: For a lovely almond-y twist, replace half the graham cracker crumbs with amaretti biscuit cookie crumbs and omit the extra sugar in the crust. Or use chocolate wafer crumbs and keep the sugar. You could also easily swap out the blueberries for almost any other berry or even other types of fruit. 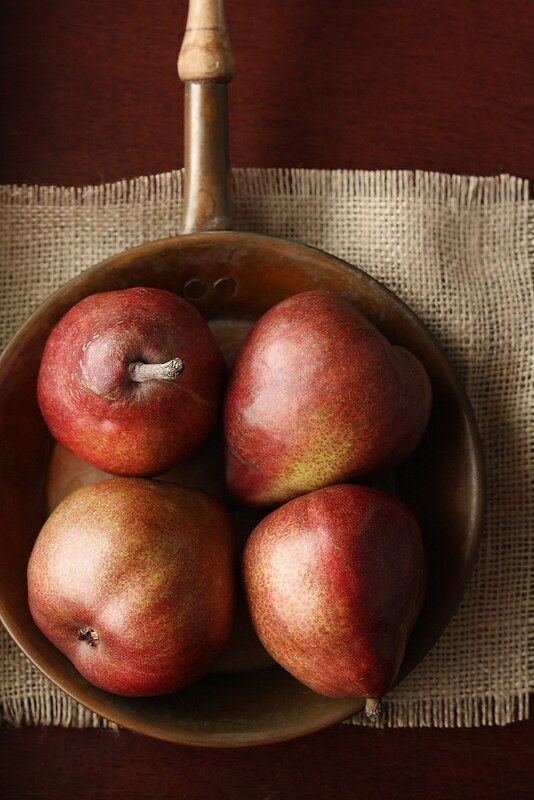 You'll want to adjust the amount of sugar according to the sweetness of the fruit you use. Have fun with it! Preheat the oven to 350 degrees F. Line 2 cupcake pans with 14 paper liners (or use 1 pan plus 2 standalone wrappers). To make crusts: in a small bowl, combine the graham cracker crumbs, melted butter, and sugar. 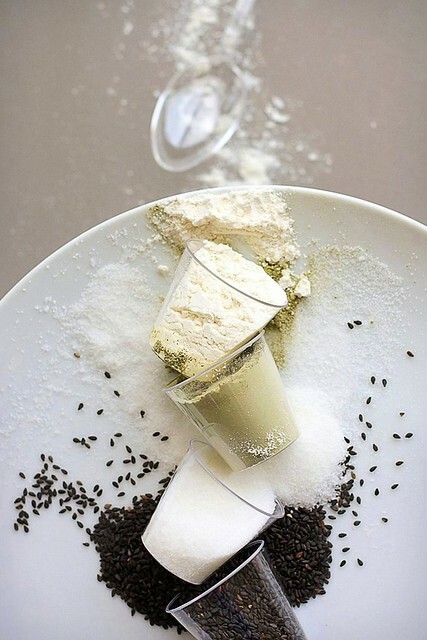 Stir together with a fork until well blended and all dry ingredients are moistened. Press 1 tablespoon of the mixture into the bottom of each cupcake liner. (A small glass or another standalone baking cup work well.) Bake until just set, about 5 minutes. Transfer to a cooling rack. 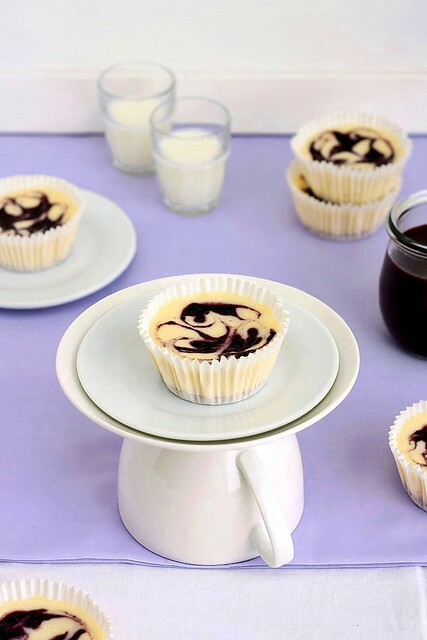 Reduce oven temperature to 300 degrees F.
To assemble: spoon 3 to 4 tablespoons of the cheesecake batter over the crust in each cupcake liner. Dot a 1/2 teaspoon of the berry puree in a few dots over the cheesecake filling. Use a toothpick or a skewer, chopstick, or thin knife to lightly swirl and create a marbled effect. Posted by Xiaolu at 10:02 PM 55 comments so far. Add your own? One of my favorite blogs is My Cooking Hut. 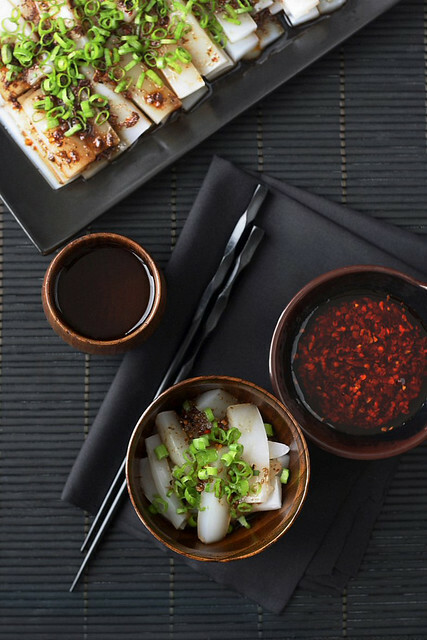 I first stumbled upon Leemei’s site years ago and was blown away by the gorgeous photography and mouthwatering French and Asian recipes. Naturally I’ve been a dedicated follower ever since. You can imagine then how surprised and delighted I was to receive her recent invitation to prepare a guest post. Immediately I thought to share a recently rediscovered favorite from my childhood in China. I'd love if you'd stop by her site to check out my guest post and recipe for Liang Fen 凉粉 (Cold Mung Bean Noodles). If you'd just like to grab the printable recipe, it's here. 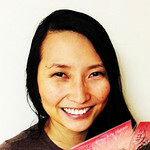 Thank you so much, Leemei, for letting me contribute to your lovely blog! Posted by Xiaolu at 5:00 PM 34 comments so far. Add your own? Can you believe it's nearly Halloween? Where has the time gone to? I'd actually hoped to share a bunch of fun cupcake ideas with you all month long, but health issues and homework ended up getting the best of me. What can I say but...I'm only human after all 8). 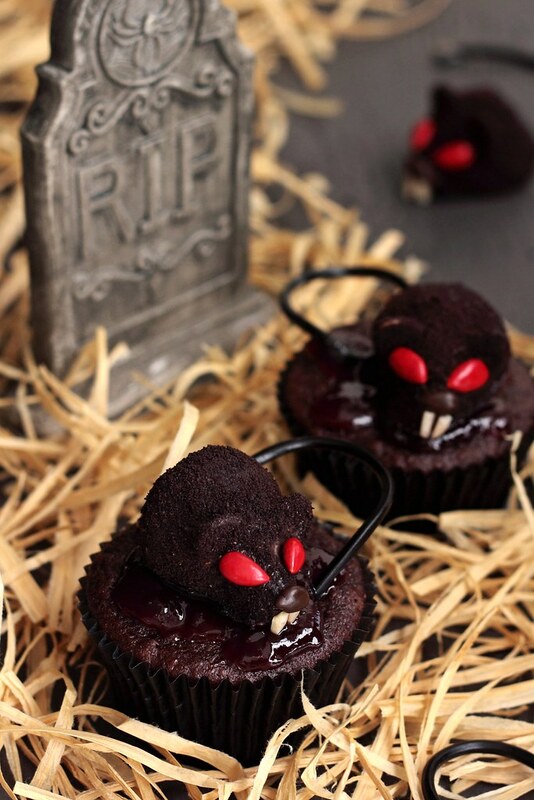 I did at least manage to churn out these fantastically creepy bloody rat cupcakes for P's Halloween party at work. I couldn't attend, but he told me they were a hit. It's the first time I've filled cupcakes simply with jam, and I quite enjoyed the taste. The "bloody" color and oozy consistency also make any red berry jam or preserve a good topping for this time of year. To be frank, these chocolate strawberry rats take a bit of time and effort to make. So I really didn't have the time/patience left to mix up a frosting anyway ;p.
It takes a few tries to get used to the rat-assembly procedure, so don't worry if you feel clumsy at first. I was impressed with the results, both the appearance -- I certainly had never associated strawberries with rats before! -- and the taste -- chocolate-coated things are generally yummy. Of course I do realize I'm posting this the day before Halloween (my bad! ), and some of these ingredients may take time to track down. If you're looking for some equally impressive Halloween cupcakes with only easy-to-find ingredients, be sure to check out the creepy crawly, mummy, and owl cupcakes from my previous posts. So do you have big plans for this Sunday? I'd love to hear all about your creative costumes and treats. Happy early Halloween, everyone! XIAOLU'S NOTES: I recommend having extra sliced and slivered almonds for the rats so that you can pick the best-shaped ones. Preheat oven to 350 degrees F and line a muffin pan with baking liners. Whisk together the soy milk and vinegar in a large bowl, and set aside for a few minutes to curdle. Add the sugar, oil, vanilla extract, and almond extract, if using, to the soy milk mixture and beat until foamy. In a separate bowl, sift together the flour, cocoa powder, baking soda, baking powder, and salt. Add in two batches to wet ingredients and beat until no large lumps remain (a few tiny lumps are OK). Fill liners 3/4 full with batter. Bake 18 to 20 minutes, until a toothpick inserted into the center comes out clean. Transfer to a cooling rack and let cool completely. Stir berry jam well, and heat in the microwave for 5 to 10 seconds. Transfer jam to a piping bag fitted with a long pointed tip OR a squeeze bottle. 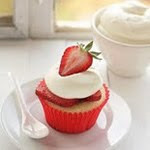 Insert tip into each cupcake and squeeze out a small amount of jam into the cupcake. Then pull the tip out of the frosting and squeeze a little more on top of the cupcake in several (bloody XD) blobs. 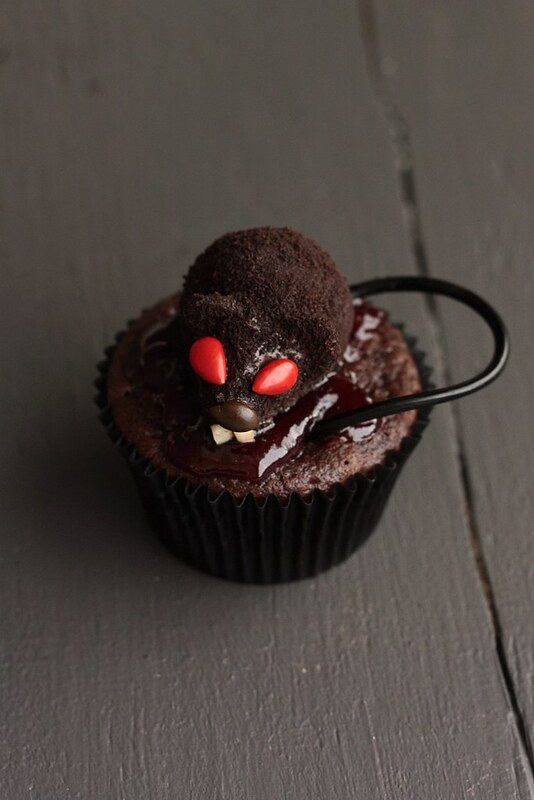 Place a strawberry chocolate rat on top of each cupcake. Insert one end of a 4-inch piece of black licorice into the cupcake directly behind the rat, then insert the other end into the cupcake on one side of the rat. Lastly and most importantly, enjoy sharing your creepy creations! Place chocolate wafer cookies in a food processor fitted with steel blade, and process until cookies are finely ground. Transfer crumbs to a small bowl and set aside. Line a cookie sheet with parchment or wax paper. Trim a small piece from one side of each strawberry so they can rest horizontally on the paper. Insert 2 sliced almonds -- about 1 inch from pointed end of strawberry and about 1 inch apart -- to make the ears of the rat. Place chocolate chips into a heatproof bowl, and microwave for 30-second intervals, stirring well after each interval, until the chocolate is completely smooth. Be careful not to burn the chocolate! Stir in the shortening and mix until smooth. Insert a fork into the large end of a strawberry (Angle the fork upwards into the strawberry so it won't slip off when you're tapping the fork later.). Holding strawberry on the fork over the bowl of melted chocolate, spoon chocolate over strawberry to coat. Allow excess chocolate to drip off, tapping fork lightly. Sprinkle with chocolate wafer cookies crumbs to coat. Tap fork lightly again to remove excess crumbs. While still holding the strawberry up on the fork, add red/yellow candies for the eyes, slivered almonds for the teeth, and brown candies for the nose. Use another fork or spoon to transfer strawberry to prepared cookie sheet. Repeat with the remaining 11 strawberries. If the chocolate starts to solidify as you're working with it, you can microwave it again at 10-second intervals until it softens again. Refrigerate (or freeze at least 5 minutes if you're in a hurry to use them) rats until ready to serve. Posted by Xiaolu at 12:00 AM 54 comments so far. Add your own? I think I've recently gushed enough about Michelle and her blog that I don't need to repeat myself. 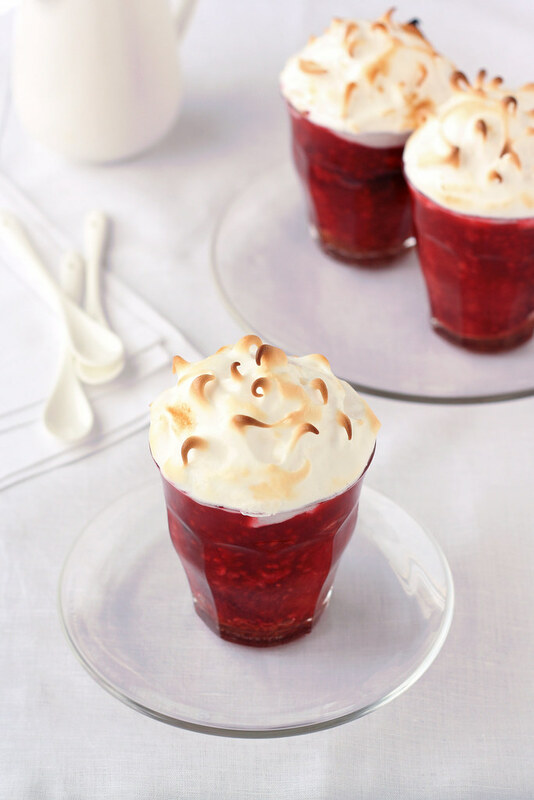 But another reason I hope you'll drop by Une-deux Senses is that I'm sharing these quick but oh-so-pretty fruit meringue pots in this guest post. If you've got a get-together coming up, these are sure to impress. If you're just looking for the printable recipe, you can find it here. Thanks, Michelle, for this awesome opportunity! Posted by Xiaolu at 4:41 PM 19 comments so far. Add your own? Last fall I discovered the blog, Une-deux Senses, when Michelle made my Ferrero Rocher cupcakes, and I immediately fell in love with it's unique mix of delectable sweet and savory food, edgy fashion highlights, and spot-on music recommendations. 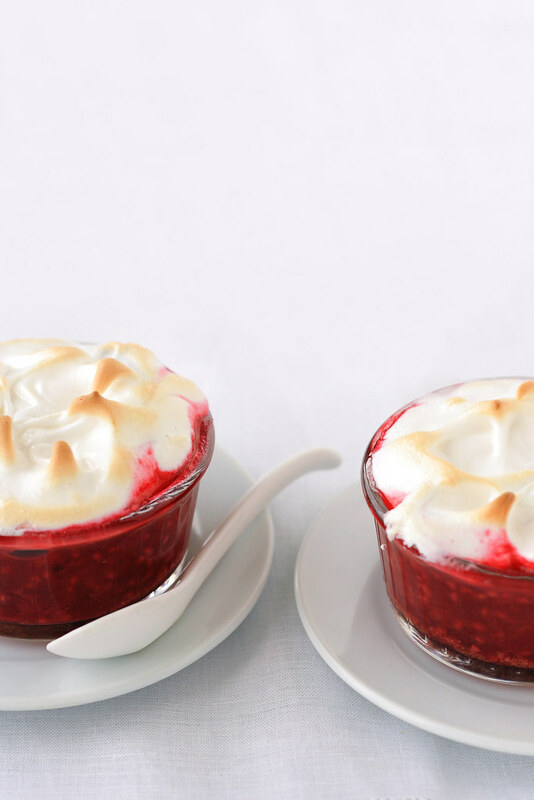 With a sweet tooth like mine, it's been impossible to resist such gorgeous desserts as her open-faced blueberry pie and creme brulee cupcakes. So I'm beyond delighted to welcome Michelle here today to share these lovely cinnamon swirl cupcakes with us! I love cupcakes, but then again, I think you'd be hard pressed to find a person who didn't! I've been oobering (if that's a word) over Xiaolu's numerous cupcake creations for ages. So when Xiaolu, the cupcake master, asked me if I was interested in doing a guest post, I was pretty flabbergasted - you should have seen my face! Me? The homely, little college blogger? I make cupcakes, sure, but I don't think they compare much to Xiaolu's cupcakes - I mean she's a winner of Cupcake Hero for pete's sake! So when choosing what to write my guest post on, I knew it had to be something good, real good. 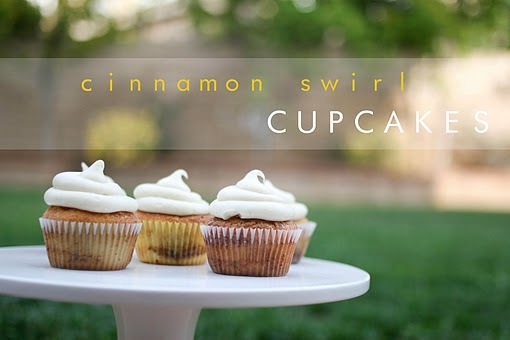 The day I made these cinnamon swirl cupcakes, I fell in love and I knew they'd be the perfect thing for this little guest post. At first glance, the ingredient list of these cupcakes seems a bit long, well, longer than I usually like my cupcake ingredient lists to be. But reading words like cinnamon, sugar and cream cheese quickly assuaged my fear. Let's just say, thank GOSH I made these cupcakes! They are now one of my all time favorites. What I love about them is that they have this warm, home-y feel - like something your mom would make, something simple and comforting. The cake itself is super light and airy with a gorgeous swirl of cinnamon all throughout it and it's literally perfect. The cream cheese frosting though, is the killer but when is this ever not the case? I could eat tubs of cream cheese frosting and not feel guilty about it! 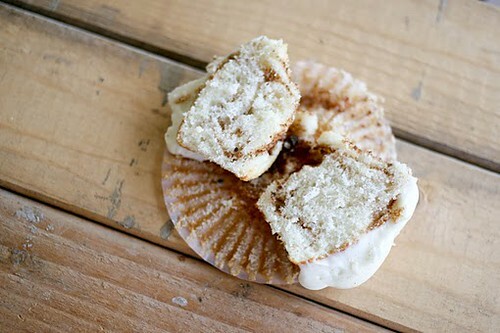 But seriously, the combination of the cinnamon, airy cake and cream cheese frosting is beyond words. Here's to Xiaolu and great cupcakes! Thanks for allowing me to share my love of all things flour + sugar + butter. To make the cupcakes, preheat the oven to 350 F. Line a cupcake pan with liners, set aside. Sift together the flour, sugar, baking powder and salt into the bowl of a stand mixer fitted with the whisk attachment. Add the butter and 1/4 cup of milk. Mix on medium speed until smooth, about 4 minutes, scraping down the sides of the bowl with a rubber spatula as needed. In another bowl, blend the eggs, egg white, remaining 1/4 cup milk and vanilla. Add to the batter in 3 additions, mixing for 2 minutes on medium speed after each addition. Scrape down the sides of the bowl in between additions. To make the filling, mix all the ingredients together in a small bowl and set aside until ready to fill the cupcake tins. When ready to fill, place about 1 1/2 tbsn. of cake batter into each muffin liner. Sprinkle with about 1/2 tsp of filling, then top with 1 1/2 tbsn. more of cake batter over the filling. Smooth the surface with the back of a spoon then use a toothpick to drag through the batter to distribute the cinnamon filling. Bake for 18 - 20 minutes or until an inserted toothpick comes out clean. Cool completely before frosting. To make the frosting, use a mixer to blend all of the ingredients together until smooth and creamy. Pipe or spread onto the cupcakes. Top with coarse sugar and cinnamon if desired. Posted by Xiaolu at 9:00 PM 37 comments so far. Add your own? S'mores are one of my all-time top desserts, as I've mentioned before, and all variations of them I find immediately go on my to-bake list. Most of my camping trips have been during the fall. So with the gorgeous autumn weather and colors surrounding us, these childhood favorites have been on my mind. 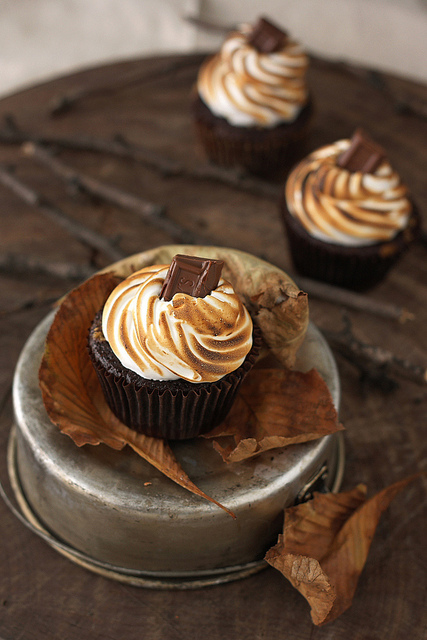 Thus when Beantown Baker posted these mouth-watering photos of s'mores cupcakes, I was sure they wouldn't remain unmade for long. Turns out I was right. These were just the thing to celebrate the recent birthday of my friend, Richard, who shares my love of s'mores. If you've ever stopped by this blog before, you know that I've baked my share of cupcakes. So you'll also know I mean serious business when I tell you these are some of the most scrumptious cupcakes I've ever baked or even tasted. Just imagine: moist chocolate cake sandwiched between flavorful graham cracker crust layers and even more chocolate chunks. 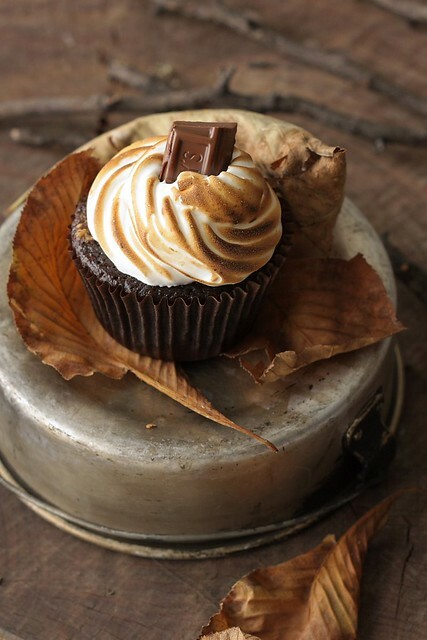 The best part, though, is the toasted marshmallow frosting that becomes delightfully gooey at first bite. So what are you waiting for? I hope I've convinced you to break out your torch and have some fun already! XIAOLU’S NOTES: You can use the food processor to make graham cracker crumbs or just throw the cookies into a plastic bag and bash away with a rolling pin or heavy bottle as I did here. Preheat oven to 350 degrees F. Line 2 standard muffin pans with 18 cupcake liners; set aside. Place the graham cracker crumbs, 1 tablespoon of sugar, and melted butter in a large bowl; stir until well combined. Place scant (just under 1 tablespoon each) tablespoons of the graham cracker mixture prepared earlier into the bottom of each prepared muffin cup. 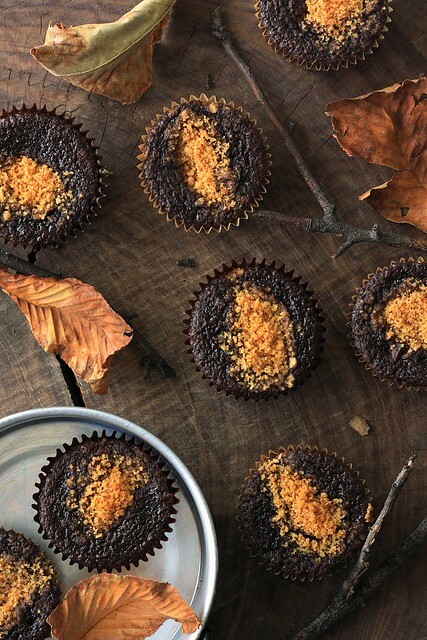 Use the bottom of a small glass to pack crumbs into the bottom of each cupcake liner. Reserve remaining graham cracker mixture for topping. Place 2 teaspoons of chocolate in each muffin cup. Set pan aside. Sift the sugar, flour, cocoa powder, baking powder, baking soda, and salt together into a large bowl. Mix these together until evenly combined. In a separate large bowl, mix together the egg, milk, oil, and vanilla. Add the liquid mixture into the flour mixture and beat on medium speed for 30 seconds. Scrape down the sides of the bowl and continue mixing on medium speed for 1 to 2 minutes. Add boiling water and stir to combine; set cake batter aside. Transfer the muffin pans prepared earlier to oven and bake until the edges of the graham cracker mixture is golden, about 5 minutes. Remove from oven and fill each cupcake liner 3/4 full with cake batter. Sprinkle each with the remaining chocolate and graham cracker mixture. Return to oven and bake until tops are firm and a cake tester inserted in the center comes out clean, 18 to 20 minutes. Transfer muffin pans to a wire rack and let cupcakes cool in pan for 10 minutes. Remove cupcakes from pan and let cool completely. Transfer marshmallow frosting to a large pastry bag fitted with a large plain round, star, or French tip. Transfer cupcakes to a baking sheet or other heatproof surface. Pipe frosting in a spiral motion onto each cupcake. Using a kitchen torch, lightly brown the frosting, taking care not to burn the cupcake liners. 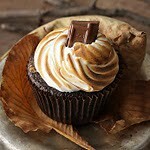 Top each cupcake with a piece of chocolate or graham cracker, if desired. Serve immediately or store in an airtight container for up to 2 days. Place egg whites, sugar, and cream of tartar in the heatproof bowl of an electric mixer. Set over a saucepan with simmering water, making sure the water is not high enough to touch the bowl. Whisk constantly until sugar is dissolved and whites are warm to the touch, 3 to 4 minutes. Posted by Xiaolu at 8:20 PM 86 comments so far. Add your own? This is slightly different from my other music-related posts in that I'm sharing an old favorite that I've recently rediscovered. The National is hand's down one of the best bands out there today. They evoke so much emotion with both their music and lyrics and are fantastic live. 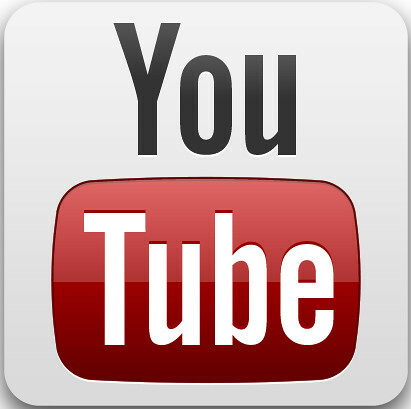 The video above is a live performance of "About Today," a song off their 2004 Cherry Tree EP. I know it's pretty lengthy at just under 9 minutes, but I promise you it's worth it. If you fall head over heels for them as I did years ago, here are a few of my other favorites: Guest Room and Bloodbuzz Ohio. By the way, this is my 100th post. Yay =D. Posted by Xiaolu at 11:54 AM 20 comments so far. Add your own? The motto of my absolute favorite food magazine is "special made simple" (I'm sure many of you immediately knew which one I meant XD). It's a wonderful approach to cooking, and I always look forward to new ways of applying it. But I also find the reverse mentality, "simple made special," equally if not more appealing. The perfect example of this can be found in my new favorite breakfast: Bruléed Oatmeal. I happened upon this brilliantly easy method on the blog, à la mode*, while hunting for creative uses for my kitchen torch. Oddly enough, I'd bought one not to make classic creme brulée but to fulfill a cupcake vision. The idea to brulée breakfast has certainly breathed new life into my neglected tool. With just a few sprinklings of sugar and blasts of heat, I can regularly transform run-of-the-mill breakfasts into treats worth getting up for. Please do make sure you have enough gas in your torch. That way you'll get more drool-inducing results like this instead of the light browning in my photo. For those of you who also own a kitchen torch, what uses have you found for it other than creme brulée? 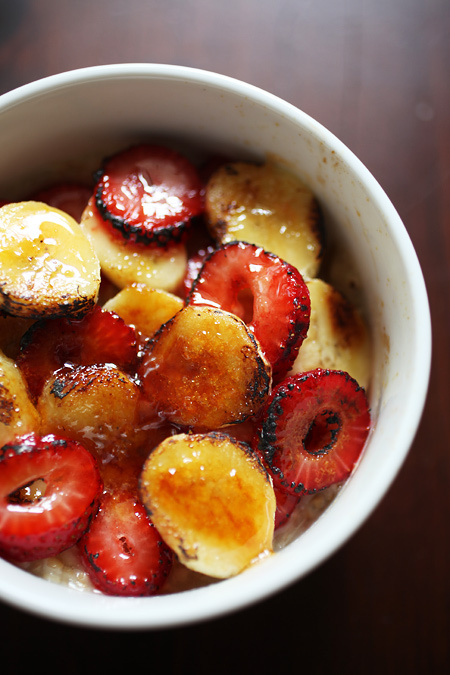 XIAOLU'S NOTES: I actually doubled the recipe for the bowl of oatmeal in the photo, but the fruit doesn't keep well so I suggest you make only as much as you'll eat right away. 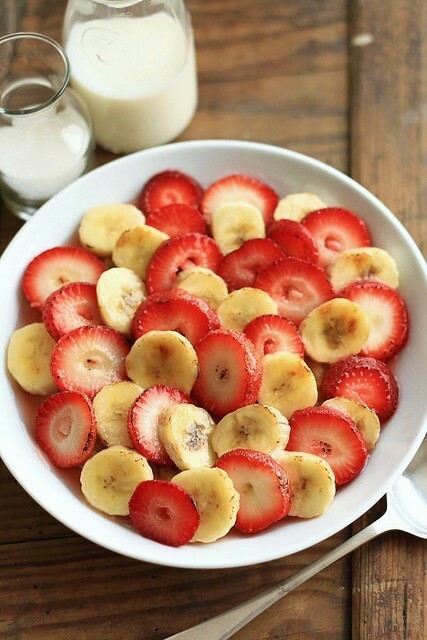 Almost any fruit can be substituted here. Just don't expect the fruit to taste cooked, since the torch is really just there to caramelize the sugar into crunchy goodness! Please be careful not to overheat the edges of the bowl or bowl may crack, and be careful handling the bowl afterwards; it will be hot! Rick from à la mode* says that a torch works the best for this, but that about 20-30 seconds under the broiler should also work. If you try this, check first that your bowl is oven-safe. Add cooked oatmeal to a heat-proof bowl. 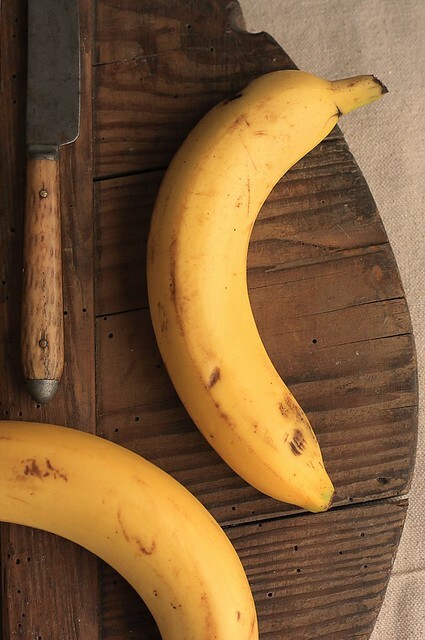 Over top, arrange sliced banana and strawberries cut side up, to expose flat surfaces. Sprinkle evenly with sugar. Light torch and heat sugar till golden brown, making sure to pass torch slowly back and forth over fruit. Posted by Xiaolu at 1:00 AM 51 comments so far. Add your own? Some days it feels like my head's not screwed on all the way. I seem to muck up all sorts of tasks, even the ones that usually bring comfort through their familiarity. Like baking up a batch of cupcakes. 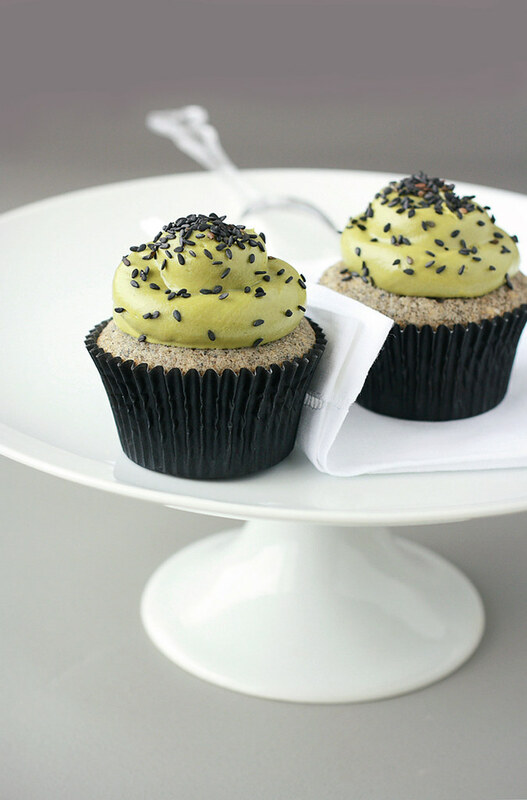 This time they were to be black sesame matcha (green tea) flavored for September's caffeine-themed Cupcake Hero challenge. The first wave of trouble hit when I attempted an ambitious photo of the ingredients. As you'll see below, it turned out to require balancing skills beyond what I possess -- oops! Well I cleaned up the mess and forged onward. So determined was I, in fact, that I ignored the fact that my batter looked thin enough for crepes... Only after pulling a gooey mess (yep, another one) out of the oven did it dawn on me that I'd forgotten to decrease the liquid when I halved the original recipe. As I dumped my rawcakes into the garbage, I couldn't help but wonder if my mind had gone on vacation without the rest of me. Have you guys had days like this, too? It took 2 days for the shame to wear off, but I did try again and apparently second time's the charm. The cakes rose high and fluffy and were filled with the distinct nuttiness of sesame. The matcha cream cheese frosting was also a success. Tangy and just sweet enough to offset the bitter edge of green tea but firm enough to pipe, thanks to a new method using cold cream cheese. What a relief it'll be not to choose anymore between flavorful but goopy or thicker but tooth-ache inducing frosting! Some of you may not be familiar with black sesame, so I'll leave you with a lil' background info. Personally, I don't feel it's very different from white sesame as whole seeds. Both are used primarily for their look and crunchiness. But when ground, black sesame has a richer and slightly more bitter flavor that I find delicious. I was introduced to it early on in Chinese treats like sweet rice dumplings (tang yuan) with a sesame filling and a pudding-like soup (zi ma hu) many Chinese believe to prevent gray hair (I doubt that works, but the seed is high in calcium, iron, copper, magnesium, phosphorus.). 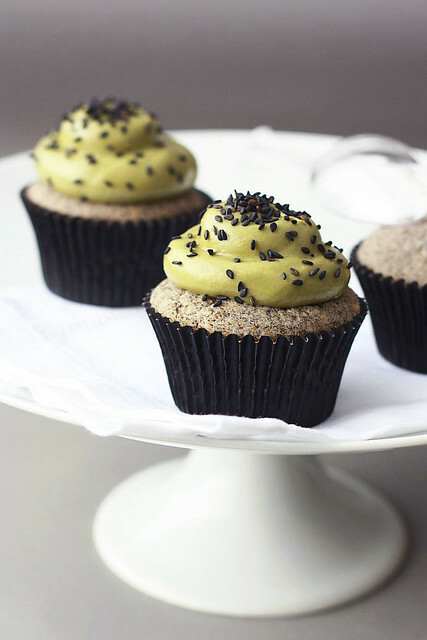 Now that I've also found these cupcakes and other creative uses for it (e.g., in panna cotta or macarons with nutella), black sesame will definitely be appearing frequently in my kitchen. XIAOLU'S NOTES: I actually used 36 g of a pre-ground black sesame powder but still followed the same toasting and grinding process. 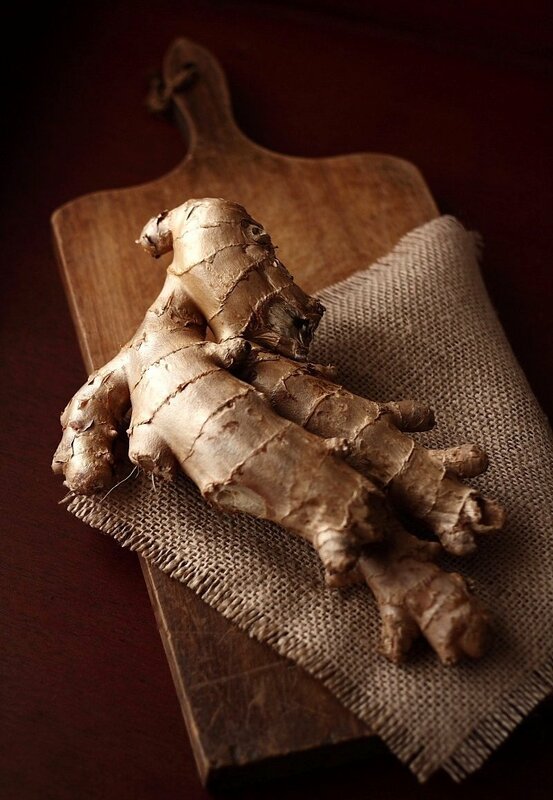 Both whole and ground seeds are available at well-stocked Asian grocers. If you're able to find and use the powder, be sure to keep a close eye on it in the pan. The frosting recipe below made a little more than needed to frost the cupcakes you see in the photos. Scale the recipe up or down, if you usually prefer more or less frosting. 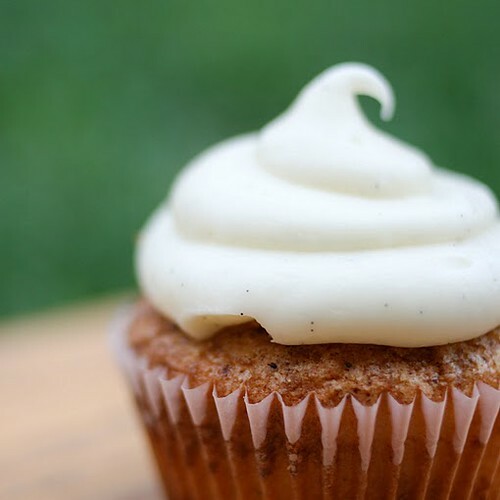 This method makes for a firmer cream cheese frosting than is common and should be pipeable. Preheat the oven to 375 degrees F. Line a standard muffin pan with 12 baking liners. Toast the sesame seeds in a dry pan on the stove over medium heat, stirring them constantly, until they are fragrant (about 2 minutes). Crush toasted seeds with a mortar and pestle OR spice grinder until they are the texture of damp sand and set aside. Separately, sift the dry ingredients into a medium bowl; set aside. Cream the butter and sugar in a large bowl until light and fluffy. Add the ground sesame seeds, egg, and vanilla and beat until combined. Gradually beat in half the dry ingredients. Add the milk and mix well. Lastly, add the remaining dry ingredients and mix until batter is well-combined and smooth. Fill cupcake liners until they are about 2/3 full (I like to use my large cookie scoop for this). Lift the pan 1-inch above the kitchen counter and carefully slam it down to expel any large air bubbles in the batter. Bake for 14 to 18 minutes, or until a skewer inserted in the center comes out clean. Remove cupcakes from pan as soon as safely possible. Cool completely before frosting as desired. Sprinkle the top of each cupcake with extra sesame seeds. Posted by Xiaolu at 3:00 AM 69 comments so far. Add your own? Posted by Xiaolu at 11:00 AM 52 comments so far. Add your own? Would you laugh at me if I told you that most of the "events" that end up making my day (or even my week) are food-related? It may be discovering the most amazing rhubarb vanilla bean jam at Borough Market when visiting my best friend in London. 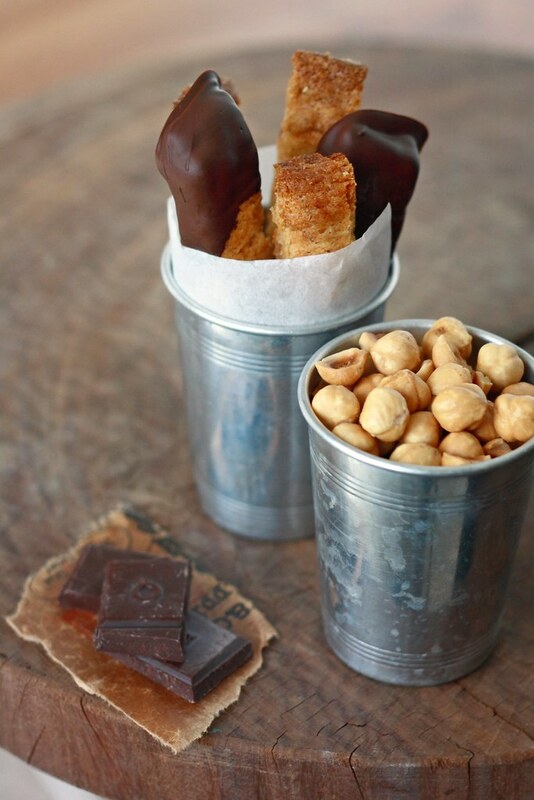 Or the addictive chewiness of NYC's speculoos spread leige waffles of Throwdown with Bobby Flay fame. While crossing state and even country lines with friends does tend to encourage food "eventfulness," it's by no means required. 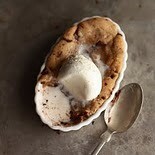 The first bite of a straight-from-the-oven pizzookie with the perfect cookie-to-ice-cream ratio, for example, was a revelation right in my own kitchen. 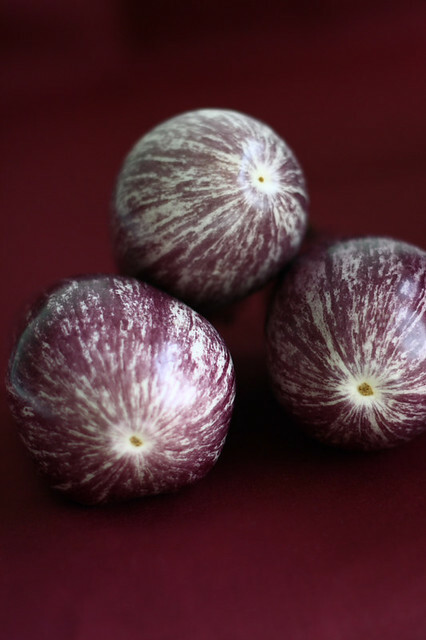 Even the humble neighborhood grocery can hold unexpected treasures, like these zebra eggplants. When I spied these the other week, I couldn't help but gasp out of admiration for Mother Nature's artistry. Best of all these beauties were mine for the same price as common eggplant. I anticipated (correctly) with some sadness that the stunning pattern would fade upon cooking. Still, if these eggplants could be made into a tasty enough dish, we'd at least be transforming one form of beauty into another, right? Humbly, I say to you that this flavorful and relatively healthy tart does justice to its ingredients. Eggplant gracefully shares the spotlight with plum tomatoes as well as smoked mozzarella and feta cheeses. And that's just the filling. A generous dose of freshly ground black pepper in the crust gives a little kick to every bite. Just enough to pull you back for another taste...and another. I did find the original recipe produced a slightly tough crust. A result, I suspect, of lowering the fat content excessively (to only 1 Tbsp?) in an attempt to healthify the tart. The recipe below includes my adjustments to the crust, but feel free to stick with the original recipe if you need to minimize your fat intake for health reasons. Even with my nitpick, I enjoyed it so much that I had it for 3 meals in a row! Now I'm looking at you, my readers. Please tell me, what are the vegetables that get you excited? And what delightful dishes do you make from them? XIAOLU'S NOTES: I loved the flavor of this crust, but had textural issues. Though I've modified the recipe to fix those problems, you're welcome to use your favorite savory tart crust recipe instead. Just add 1/2 tsp freshly ground black pepper to the dry ingredients. For the filling, make sure to slice your eggplant no thinner than 1/4" thick. I sliced a bit too thinly, which resulted in them being slightly dry when baked. The original recipe also called for salting the eggplant. To save time, I've skipped that step but as a result it's important to use fresh eggplant so that it doesn't impart a bitter taste. To prepare crust, lightly spoon flour into a dry measuring cup; level with a knife. Combine flour and next 4 ingredients (flour through 1/4 teaspoon salt) in a large bowl, stirring with a whisk; make a well in center of mixture. Add 2 tablespoons of water and all the oil, stirring to form a soft dough. Add more water, 1 tablespoon at a time, if needed to make the dough come together. Turn dough out onto a lightly floured surface; knead lightly 4 times. Gently press dough into a 4-inch circle on plastic wrap; cover and chill 15 minutes. Slightly overlap 2 sheets of plastic wrap on a slightly damp surface. Unwrap dough, and place chilled dough on plastic wrap. Cover with 2 additional sheets of overlapping plastic wrap. Roll dough, still covered, into an 11-inch circle. Remove top sheets of plastic wrap. Fit dough, plastic-wrap side up, into a 10-inch round removable-bottom tart pan coated with cooking spray. Remove remaining plastic wrap. Press dough against bottom and sides of pan. Pierce bottom and sides of dough with a fork; bake at 400° for 10 minutes. Cool completely on a wire rack. 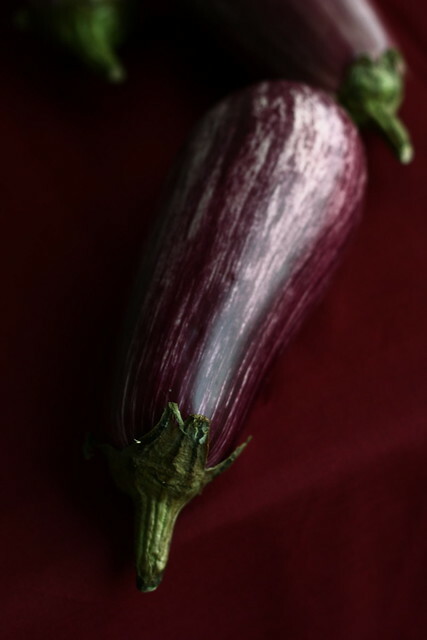 To prepare filling, arrange eggplant in a single layer on a baking sheet coated with cooking spray. Brush slices with 1/2 teaspoon oil and sprinkle with 1/4 teaspoon salt. Bake at 400 degrees F for 20 minutes. Stack eggplant slices on a plate; cover with plastic wrap. Let eggplant stand 7 minutes to steam. Using more towels, pat tomato slices dry. Heat a large nonstick skillet coated with cooking spray over medium heat. Add garlic; cook 1 minute, stirring constantly. 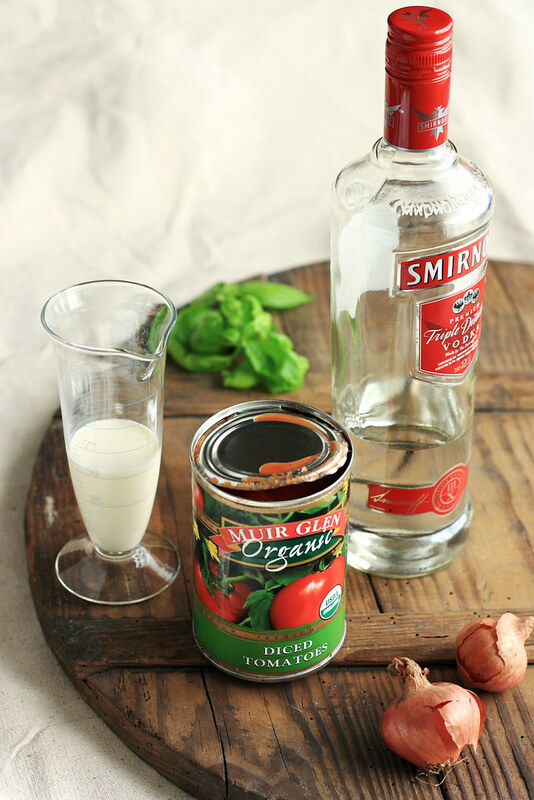 Remove from heat; stir in 1/4 teaspoon salt, basil, oregano, mint, and tomatoes. Sprinkle 2 tablespoons smoked mozzarella and all the feta on bottom of baked crust. 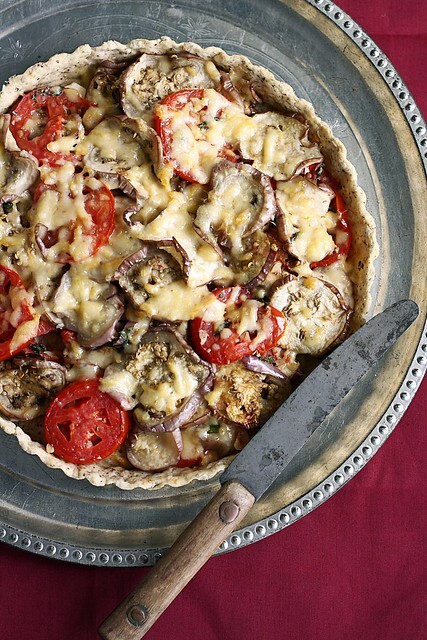 Layer eggplant and tomato mixture in crust, and top with 6 tablespoons smoked mozzarella and parmesan. Bake at 400 degrees F for 10 minutes or until cheese melts. Cut into 8 wedges. Posted by Xiaolu at 8:00 PM 59 comments so far. Add your own?